Over the past few years, Perth’s health and wellness scene has taken off and we are loving it! From the juice cleanse companies to the healthy cafes, from the wellness warriors to the hip yoga studios sprouting up all over town, Perth has got it going on. To celebrate all of Perth’s health magic, we’ve created a cool little health and wellness series which will allow you to gain insight into the lives of some of Perth’s healthiest cool cats. They’ll share their tips and tricks and a whole lot of inspiration to help you live the healthiest life ever. Yesss! This week, we met with Shaheen Hughes, the culinary superstar behind Perth business Spice Mama. 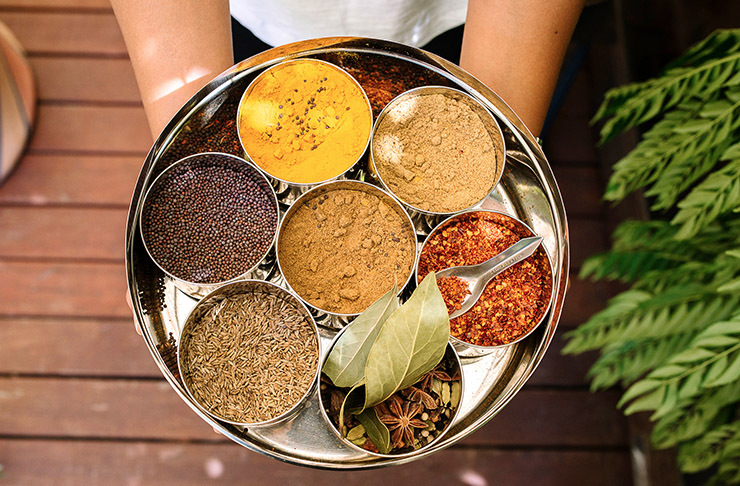 Shaheen has a big love for food, traditional cooking practices and above all family—and her amazing spice mixes are a flavour sensation. We took ten with Shaheen to talk about her business, how she likes to keep healthy and where she likes to grab breakfast in Perth. Hey Shaheen, tell us a bit about yourself! I was born in Bombay and have lived all over the world, but Perth has been home for the last 20 years and I love living here. I still get homesick, for so many places, and when I’m homesick I cook. I love Indian food, cooking it and sharing it with the people I love. The traditional food we cook at home, using freshly ground spices, local, seasonal ingredients, vegetables and dals, is based on one of the oldest and healthiest cuisines in the world. What spurred you on to start your business? When my granny died a few years ago I was given all her old handwritten cookbooks, full of fabulous recipes. Spice Mama was my tribute to her—she loved food, and cooking was a great way to remember her. I started hand roasting and grinding my own natural, small batch spice blends so that I could replicate some of the curries made by my family for generations. Now I’m selling them online, and in a few retail shops in Perth—my granny would love to have known so many people were cooking with bottle masala. 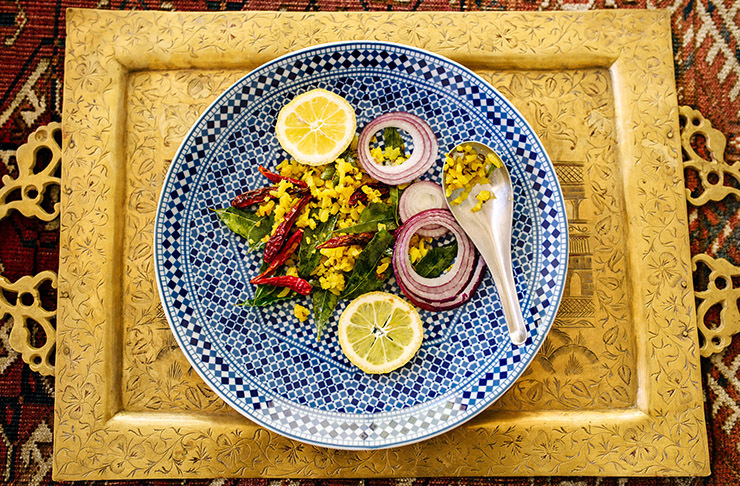 I hope my spices, recipes and pop-up cooking workshops will encourage people to cook more adventurously and learn more about a traditional way of eating Indian food and cooking it from scratch. I really believe in the benefits of bringing old knowledge back to life, understanding the food our ancestors ate and using food as medicine—much of this knowledge dates back to Ayurvedic practices around five thousand years old and should never be lost. Have you always been fit and healthy? No, not even vaguely! It was difficult when the kids were small, I didn’t have a full night’s sleep for years. There were days it was hard enough to get out of bed, let alone exercise or eat well. I wish I’d been kinder to myself then. What’s a regular day look like? It’s always a juggle with kids and no two days are the same. At the moment I’m cooking lots—I’m happiest in the kitchen. I’m trying out a lot of old family recipes, and I’m also thinking up new ways to use spices to make really tasty, beautiful looking, modern Indian food. I roast and grind spices to make my bottle masala and vindaloo masala a couple of days a week—this is my favourite thing. I love the smell of roasting spices, it takes me back to being five years’ old in my granny’s kitchen in Bombay. I’m also doing more teaching—at least once a week I have a class at Sophie Budd’s Tastebudds Cooking Studio in Highgate or a pop-up cook club, which I run with my mum. I really love talking to people, teaching them about the culture and recipes I grew up with, and hearing their own stories—so many people have such amazing memories of cooking with their grandmothers and eating the comfort foods of their childhood. This is it! Spice Mama is my dream job, after many years of a more corporate life I’ve taken the plunge to start my own business. Yoga, but it’s never as peaceful or calming as I imagine it will be. Mornings in our house are chaos, so I could easily have a cat climbing up me, be signing a homework diary or tying a shoelace while trying to stand on one leg. Only use natural flavours, colours and preservatives in the food you cook. Spices add taste and colour to your food, they can help you reduce the use of salt, sugar and artificial ingredients, and are so good for you. They are the original super foods, with compounds that fight cancers, are anti-inflammatory, anti-oxidant and anti-bacterial—people still eating traditional diets have much lower rates of chronic disease than in the western world. And you don’t just have to like Indian food—you can use turmeric and cumin in your rice or your eggs, put cinnamon in your porridge and coffee, cardamom and ginger in your tea, mustard seeds in your potatoes—there are heaps of clever and tasty ways to use spices every day. Best place to get a healthy treat in Perth? I like shopping for good ingredients to cook with more than eating out. I like getting fresh herbs and veggies and poking around for interesting things and spicy snacks in local Asian grocery shops like Daily Supermarket and Golden Choice. Lots more hard work I think. I’d like to do more cooking classes and pop-up supper clubs. I also want to study, there is so much to learn about the benefits of traditional food and medicine. Somewhere in Leederville—Pixel, Oxford Yard and Sayers. My mum’s house. I just don’t think you can beat a home cooked meal, made by someone that loves you. All the little boutiques in Leederville, Northbridge and North Perth—there’s always something interesting to find and it’s good to support local business. Want to know the best places to get healthy in Perth? Search 'Health' in The Directory!